Liberty Lake’s brown trout seem to drop their guard for a couple weeks at ice-out and then get tough to catch. The lake has a big smallmouth population. Walleyes stocked almost annually for 10 years are finally starting to take hold. The key is that in the past two years the state has been able to get fish big enough – 3-5 inches – to survive after stocking. “Our goal isn’t to develop a big walleye fishery but rather to have a predator that will help increase the lake’s bluegill to a size people will want to keep,” said Chris Donley, state fisheries biologist. The season isn’t open yet, but the fishing has been good the past two weeks for Chris Donley, Washington Fish and Wildlife Department Spokane district fisheries biologist. Recently he pulled survey gillnets that had been soaking overnight in West Medical and Fishtrap Lakes and found an exceptionally healthy crop of fat, rainbow trout. “The fry plants from last year are enormous,” he said, pointing a cold, wet finger on a blustery day to one of the specimens coming into the boat at West Medical. “This lake can really grow fish. These are almost too big. Makes me wonder if cormorants or something thinned out the fry plant. I can’t say for sure. Although many of the mixed species lakes and selective fishery waters already are open, Fishtrap, West Medical, Williams, Badger and other lowland trout fisheries won’t open until April 30 – the latest possible opening date under the “last Saturday in April” rule. Fishtrap and West Medical should be in their prime, just two years after the nongame fish were killed out with rotenone and the waters restocked with trout. Williams should be good, but Donley fears fishing will be tough in Badger, where smallmouth bass are taking hold. Silver Lake’s great largemouth bass, bluegill and crappie fishing has deteriorated after someone illegally introduced perch that overpopulated. Lake homeowner groups have not been able to agree on fish management options that would require a concensus before the state could do much to improve the fishery. Top panfishing lakes in the Spokane region include Eloika, Bonnie, Downs, Liberty, Newman and Bear Lake, which is off Highway 2 and open only to youth and disabled anglers. Sprague Lake has a large number of trophy-size trout, and by this fall, the re-started bluegill and crappie fishery should start to show. 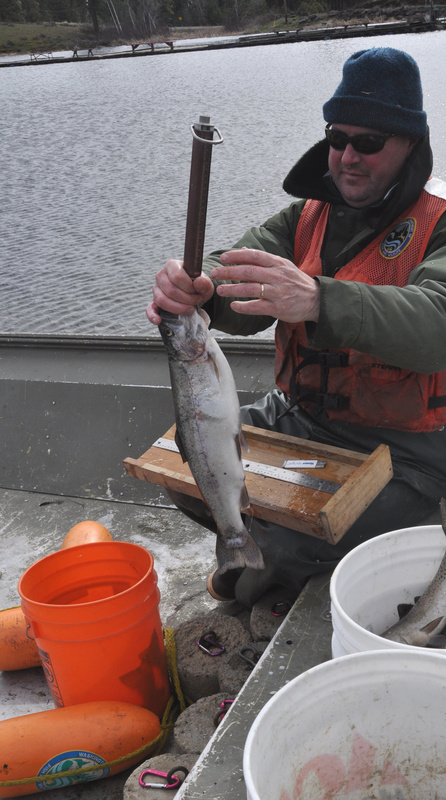 Selective fisheries, such as Amber Lake, have been producing excellent catches of huge trout. While Donley was surveying fish at West Medical, a fly fisher stopped by and reported catches of up to 20 fish a day at nearby Medical Lake, a selective fishery where bait is not allowed. Most recently, the top fly was a chironomid fished under an indicator. After the angler left, Donley showed me why as he opened the stomach on one of his survey fish and showed the contents. It was stuffed with large green chironomids.